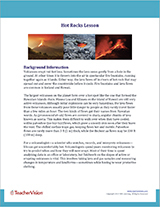 Use the slideshow, teacher resources, and student worksheets in this science mini-lesson to give students a general overview of lava and volcanos. This mini-lesson can be taught as part of 1 or 2 45-minute class periods. The activities and exercises can be completed in class or given as take-home assignments. The lesson content is accessible and approachable for both science teachers and generalists, and includes background material for brush-up or pre-lecture preparation. 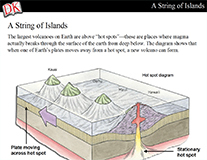 Use this mini-lesson to introduce students to the concepts of "hot spots" and to discuss the different kinds of lava that flow from active volcanos. Discover the power of volcanoes and earthquakes, from hot spots to tsunamis, in this visually-stunning guide.